I am Stephanie Bell, i am a mommy of two girls and got interested in baby-wearing while researching cloth diapers before my first daughter was born. In this photo i am wearing my DD2 Paisley who is a lil over a year and a half in this photo. I am wearing here in a mesh water sling on our day at the Wildwood water park in wildwood nj. Chris my DH took this picture while he was chasing our DD1 (emmy 3yrs) in the lazy river. 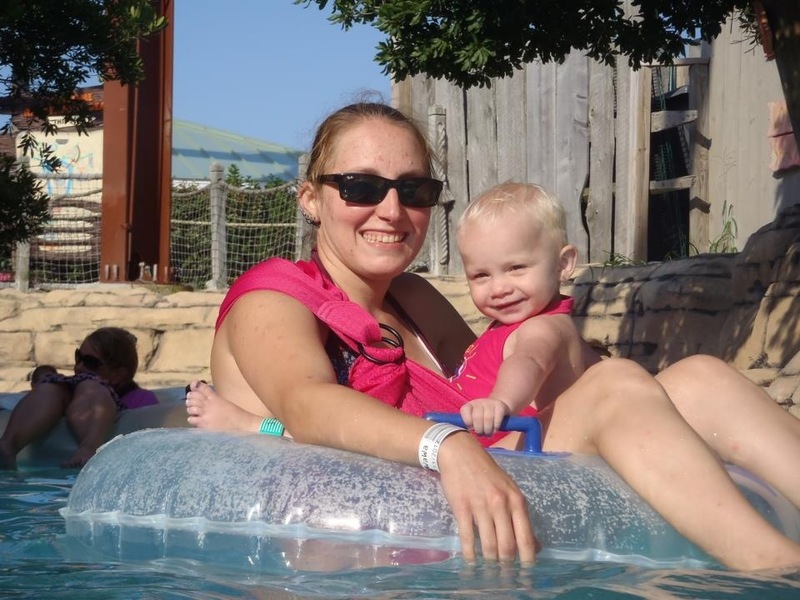 in this picture i am wearing a mesh water sling and floating in the lazy river. we are listening to the laughter, the nearby ocean and the water crashing from the surrounding water rides. this sling made this trip truely enjoyable. the family as a whole was able to enjoy the water. and have fun. this babywearing was for safety and convience of the water park. this made it so i was able to keep my non swimer safe without her have to be burdened with an uncomfortable life vest.